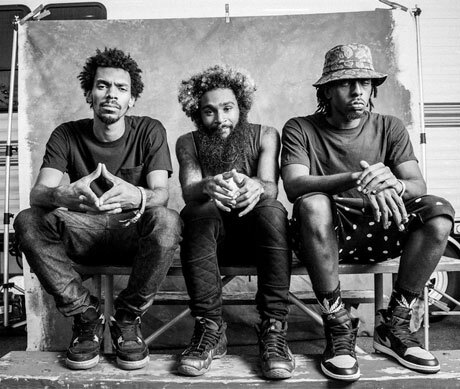 Last Friday Flatbush Zombies, a hip-hop trio based in Brooklyn, released their debut album 3001: A Laced Odyssey. Although this is their first album, this is not their first time releasing music. The Zombies have previously released two mixtapes (D.R.U.G.S. and BetterOffDead,) as well as an EP (ClockWork Indigo) and it's clear the group has been busy since their last project with The Underachievers. 3001: A Laced Odyssey covers a range of sounds. I found the the broad spectrum of instrument features on the album to be a nice addition. Even the album art is tough. David Nakayama, a talented concept/comic book artist, worked with the group to help capture the trio and concept of the album through illustration. The album opens with The Odyssey, starting the album off through narration. This song brought back some memories of D.C. The drums and the echoing sounds that resembled live music reminded me of D.C. Go-Go. I have never been a big fan of Go-Go but it reminded me of the lively genre all the same. The track also samples songs from their last mixtape BetterOffDead, using lines from both Nephilim and Palm Trees. Bounce sounds just as the title suggests. A song anyone can't help but nod their head to. Bounce was the first single to be released off the album. The song was followed by a dark video released this past February. R.I.P.C.D. is another track on the album with a self explanatory title. The group makes a track dedicated to the Compact Disc, which has now almost become obsolete. The song almost seems to be saluting all the things from the past that bring good memories but that are now dated or non-existent. A Spike Lee Joint is one of those go to tracks when you're in the mood to chill. The song has a laid back vibe and brings in the saxophone mid song. The incorporation of the woodwind gives it that hint of jazz so commonly heard in Spike Lee films. Fly Away continues with the theme of instruments by opening with the piano. I love the piano so this caught my ear right away. This particular track sounds completely different than any other on the album and is solely covered by Meech. Very personal and introspective Meech reflects on his own thoughts and existence. Right behind Fly Away comes Ascension. Schematically this is an intriguing set-up and is a bold follow-up to Fly Away. Ascension is another track by Meech. The song builds up slowly beginning with what sounds like could either be the chimes or xylophone before kicking into a trap-style beat. Haunted and unsettling are the best words I can use to describe the sound and overall feel of this song. But interestingly enough the song ends on a completely different note closing the with the addition of bongos. After Fly Away and Ascension the album takes a turn and begins to slow down. The vibe begins to become more lowkey and the flows become smoother which can be felt and heard throughout the next three tracks: Trade-Off, Good Grief, and New Phone, Who Dis. It is not until we get to This is It and Your Rap Favorite Song, the last two songs on the album, that we begin to hear another shift . This is It is the second single to be released from the album. It was made available just before the Zombies decided to drop their album. A music video was also released for single. The video is a simple black and white theme featuring nothing and no one more than the three artists. I can say this is probably one of my favorite songs on the album. It has the most cohesive sound and displays each rappers talent individually.